The success of two new FA Wildcats girls’ football venues earlier this year has ensured the project will continue in the area. Predators and Easebourne’s SSE Wildcats centres have both been granted extensions for delivery of the FA’s girls’ football initiative until at least the end of the year. These drop-in sessions are open to all girls attending primary schools and sessions are running on Mondays 5pm to 6pm at Longbrook Pavilion, Bognor (home of Predators FC) and the Easebourne sessions are being hosted by Easebourne Primary School near Midhurst on Wednesdays, also 5-6pm. Both sessions are being run by South Coast Sports Coaching Ltd and cost just £3 per session. Funds raised will be put back into girls’ football in the area. The aim of these sessions is to introduce girls to the game in a fun and supportive environment, as well as developing the existing skill sets of those girls already playing regularly. There are a number of girls attending from both Felpham Colts and Bognor Regis Town FC. Both clubs are keen to welcome new players, with Felpham Colts seeking girls eligible for under-tens and 11s. This term, as well as the regular weekly sessions, there will be focus sessions for goalkeepers, SAQ (speed, agility and quickness) and health and wellbeing. * Bognor Regis Town Girls’ FC celebrated the first anniversary since they were reformed after many years without a girls or ladies’ side at the club. 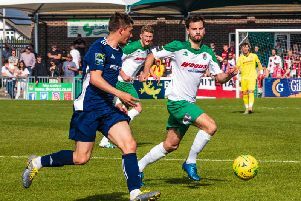 Mark Patterson, who started the team because his daughter Evie wanted to play football, began with only 12 players ranging from under-eight to under-15 and enjoyed training on a Saturday morning at Hawthorn Road, Bognor. One year on the club now have 80-plus girls registered with the club with five teams registered in the Sussex Women’s and Girls’ League. Patterson said he was surprised how the club had grown over the past year, and it was a pleasure to see how the girls enjoyed the training and made new friends, with their team spirit and attitude commendable. He was thankful to all the people who had helped especially Gemma for her hard work at three trials nights and training. He also thanked the coaches and managers. The need for a girls’ side in Bognor was seen at trials nights and things moved forward quickly. All the players were presented with a certificate and given a Rockette cup-cake to mark the anniversary. If you’re intrerested in joining, pop along to training on a Saturday, 10.30am to midday, at Jubilee Playing Fields, Chalcraft Lane, Bognor. They especially need under-12s (Year 7), under-13s (Yr 8) and under-14s (Yr 9) – in addition to the under-seven to under-11s.